Patty is the first pig I loved. A decade ago, I became a caregiver. During breaks, I trekked to the pig barn searching for "the oreo pig". I settled next to her and read. She would grunt and lean into me. Those moments spent together are unforgettable. I cherish them now. 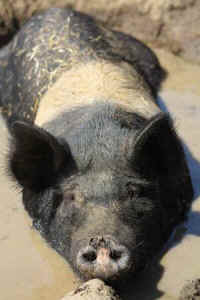 If you visited Animal Place in the past four years, you met Patty pig. Iconic black and white Patty loved visitors, stretching languidly out for belly rubs. Last week, we said goodbye to the oldest porcine resident. She died surrounded by an immense amount of love, passing peacefully after a battle with cancer and infections. It is hard watching the "old guard" pass. Patty was one of four "diva" pigs - Flower, Susie, and Valerie. They were a clique of pigs, spending naps together, fighting over food, tussling playfully in the pastures. Patty was the sole survivor. The herd is now without a matriarch. For two days, Patty could not stand up. She could not move from her stall to urinate or defecate. I scooped poop from beneath her back - she elevated her hips enough for me to get it out. We moved wet straw out, replacing it with dry. Patty suffered from hoof infections for the past two years. She beat those infections back and surprised us with her strength. It could only take her so far, though. The infections and cancer caught up with her, rendering her immobile. Pain medications stopped working. She could not turn over onto her left side to alleviate the stress placed on her right. Prolonging her misery and suffering was a cruelty we would not inflict upon her. There is a sense of unfairness in that decision making. We hope it is forgivable. The veterinarian came with the sedative. Patty chomped down vegan lemon cookies, apples, and bananas. She fell asleep in her water bowl. The veterinarian returned for the final injection into an ear vein. Patty's breath slowed, then stopped. Her long, glorious life ended with four Animal Place staff - dedicated Patty fans - by her side. I do not know what, if anything, is after death. I am unsure of what I experienced in the moments after Patty's death. Everyone left. I stayed by my friend's slowly cooling body. I sobbed. I became selfish and greedy and so genuinely human - I demanded she returned, I asked why she had left, I cried tears for myself and for the loss of Patty's great light in this every dimming world. When you cry in sorrow, panic fills up your chest and stomach. It is sadness mixed with fear. As I asked why she had left, I felt what I can only describe as calm, loving energy flow through my body. While I had not cried all my tears (more would come later), I felt peaceful. There may be a perfectly scientific, rational explanation for what I experienced. I choose to believe it was Patty. Patty will be missed, but I don't think she missed out on living life to the fullest. If you met Patty, consider it a great honor. You met the flesh and body that held a great soul. You were always there; awake, alert, excited, hungry, happy, sweet, feisty, comforting and loving. Gentle but so strong, you never gave up. As soon as you heard me coming your way, you would jump up and try to make your way to me, but most of the time you would just roll to your side and expose your belly for me to rub. You never said anything to me, but every day you showed me you were there for me, you didn’t mind me. I felt comfort with my hand against your skin. Through the past three years I built an incredible friendship with you, and I know you felt the same way; at least I think you did. I looked forward to caring for you, feeding you, kissing you goodnight. Over those three years you were there for me in more ways than you know; through dark days, broken hearts, anger, frustrations, and I could always talk to you. I knew where to find you and you always listened, and never seemed annoyed with me. I knew you were in pain, but you never acted out or complained. You had the warmest soul I have yet to encounter, and I only wish you lived longer. I wish I spent more time with you, and gave you more treats and snuggles. You taught me a kindness I will never lose; because of you I stopped consuming all animal products and learned a more compassionate way of life. I stopped being ignorant and in denial of an unnecessary need. I cried over you many times, and was judged for even loving you and sticking up for you. I was mocked, laughed at, and had parts of flesh similar to yours waved around my face as if it was some kind of joke. But no matter how big, small, quiet, loud, aggressive, friendly, peaceful, upset, intelligent, useful, beautiful, and important, you always matter to me. To some you are just a pig, a meal that lasts no longer than a moment; something to profit off of or be entertained by. Everyone has their excuse, and each time I could argue a million points because I had the pleasure of spending so much time with you; and I only wished everyone felt the same. I hope you know you were never seen that way by me or those who worked hard to save you, and keep you safe. We put you on a pedestal; we worked over time, and tried to think of a hundred ways to keep you comfortable and happy. We cherished every time you reminded us of how strong you were and only thought highly of you. You brought smiles to thousands of faces young, old, vegan and non-vegan. You taught more people than just me about love and kindness, you taught happiness, gratefulness. I love you, and have never felt a deep sadness from losing a loved animal like you. I am forever grateful for knowing you, and know you feel no more pain in your body. I will never forget you, I will love you forever. Rest in peace Patty the Wonder Pig, thank you for everything. I first met Patty on 4th of July 2006 during a volunteer orientation. She was the first pig I ever met. What I'll always remember about Patty is her gentle, caring soul. Her maternal instincts shined whenever there were piglets. 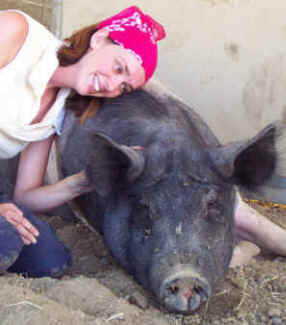 When Owen first arrived as a baby, before he could interact with the other pigs, he was put in a stall with Patty. She mothered him like he was her own. They took long naps nestled together and she put up with, and I think relished, his play behaviors. Owen would jump on Patty's head and chew on her ears and she was perfectly content. I witnessed the same mannerisms with Hazel. Patty never got to raise her own babies, which it seemed she longed for, but she was able to develop a maternal bond with her adopted piglets at Animal Place. It was beautiful to witness. She had a wonderful life at Animal Place and will be sorely missed.